Die Singphoniker is a six-man vocal group which has been in existence for twenty-five years and has made nearly thirty CDs. Although the ensemble claims that its original inspiration, to which it remains true, was the Comedy Harmonists (or the Comedian Harmonists, as the group seems to have become known in recent times), Die Singphoniker shows every sign of being much closer in spirit to the King's Singers; a comparison that will doubtless be far from novel. Nevertheless, the comparison is apt not just because both the King's Singers and Die Singphoniker are all-male ensembles comprising six singers, but rather because of the repertoire of both groups. The King's Singers established its reputation originally for its versatility and the wide-ranging repertoire that it performed, and went on to commission and perform new works from contemporary composers on a regular basis, while continuing to perform a huge variety of works from early music to modern-day popular songs. Die Singphoniker, although younger than the King's Singers, as a group, by a dozen years, has taken a similar path, with a similarly wide-ranging repertoire from Gregorian chant to modern-day pop music, and also with an interest in performing new music. That is not to say that the German group is a clone of a British original, of course. Die Singphoniker has its own style and repertoire, and to look at the catalogue of 28 CDs currently listed on the group's Web site, it's clear that a high percentage of them present worthy musical projects, such as a five-CD set of the complete Schubert part-songs, and similar surveys of the part-songs of Grieg, Richard Strauss, Reger, Michael Haydn, Mendelssohn and others; though a few CDs represent lighter entertainment, such as a Comedian Harmonists tribute disc. The group's composition is different, too: whereas the King's Singers have two altos at the top, Die Singphoniker is more bottom-heavy, with two tenors at the top, the remaining singers being baritones or basses. Having said that, at least one of the two tenors can also sing counter-tenor, and performs in the alto range for most of the tracks on this Christmas CD. I have also never known the King's Singers to expand their ranks with guest singers (as opposed to guest performers of other types) for any of their recordings, whereas this Singphonic Christmas CD features two guest basses, singing alongside the regular group members, as well as a harpist. All this comparison with the King's Singers merely serves to underline the fact that this CD is something that could easily have been done by the British group, and King's Singers fans are likely to enjoy this CD, whether their preference is for the lighter or the more serious side of the close-harmony repertoire. Comparisons with the King's Singers are hard to avoid while listening to this disc, which is partly why I've spent time discussing both groups here, but of course the sound is quite different even though the format is similar. Happily, the German ensemble lives up to the kind of performance standards expected of the British group. The performances are virtually flawless and the ensemble is unerringly perfect, with not a hint of a ragged entry at any point; the voices sing as one. The balance of the recording is also excellent, allowing every voice to come to the fore whenever it needs to do so. Having said that, I did feel that the melody was occasionally swamped slightly when it was carried by an inner part, and there was an occasion example of slightly imperfect tuning in one voice or another. However, these were very rare and minor problems, only happening for a handful of brief moments. Overall, there's very little to complain about here, in terms of either the recording or the performance; every singer is excellent, the recording quality is good and the final result extremely polished. 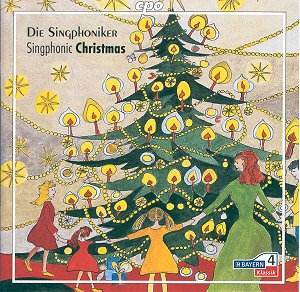 The Singphonic Christmas CD presents a wide range of carols and other Christmas music from around Europe, though with a slight emphasis on the Germanic. Twenty-one tracks, including three for harp solo, include a fine mixture of the well-known with the unfamiliar. Most items are for four to six voices, and, aside from the three harp solos (including the Interlude from Britten's A Ceremony of Carols), the harp accompanies the singers in a number of items. Even the familiar items are presented in new arrangements, many of them written by members of Die Singphoniker. This ought to be a good idea, in that there can be no-one more familiar with the possibilities of the group than its own members, and in many cases the arrangements do indeed work well; I particularly liked Alfons Brandl's straightforward arrangement of Grieg's Du gr�nne, glitrende tre, for instance. Unfortunately, the majority of the Singphoniker-originated arrangements are by Ludwig Thomas, one of the group's baritones, and I'm sorry to have to say that I didn't take to them at all. Whilst I regret having to single out one individual for criticism, the fact is that eight of the tracks on the CD have been arranged by Thomas, and I could spot them all immediately because of their quirks. Even on the very first occasion that I listened to the CD, I noticed an obvious pattern and was able to detect which pieces Thomas had arranged, before confirming my suspicions by checking in the CD booklet. It's not that Ludwig Thomas' arrangements are poor quality or badly done; they're not, and I have no doubt that he used to score highly in his harmony exercises when he was studying music. Technically, they're interesting and harmonically clever, and practically they work well enough, showing off the capabilities of Die Singphoniker. The problem with them is that they sound far too contrived and gimmicky for my taste. They modulate between keys at the drop of a hat, and sometimes do so in the middle of a familiar melody, for which I think there's no excuse. There's even less excuse for altering notes within a familiar melody to bend it into the shape of your peculiar harmonic ideas, but that happens frequently, too. At other times, familiar melodies are sung over an unexpected, and therefore apparently wrong, tonal centre, and at yet other times, the expected melody is lost entirely, to be replaced by something new that follows the expected melodic shape but isn't actually what you expect to hear. It's not that I'm a fuddy-duddy; it's not that I want to hear only boring arrangements with simple, traditional harmony. I have nothing against clever and inventive new arrangements as long as I feel that they actually work. Unfortunately, I don't feel that Ludwig Thomas' arrangements are very successful; they're not awful, but they do seem far too gimmicky for my taste, and unfortunately they comprise more than a third of the tracks on the CD. However, that's only my personal opinion, of course. While working on this review, I took a look at Die Singphoniker's Web site and found a link to Classics Today's recent review of this CD, in which the reviewer highlighted the Ludwig Thomas items as being first-class arrangements, worthy of being singled out for particular praise. Each to his own; what that reviewer liked best, I found to be the most disappointing aspect of the disc. That other reviewer also complained about the harp being an unwanted and extraneous accompaniment to several of the tracks. Again, I couldn't disagree more; for me, the beautifully-played harp really added some attractive and valuable colour to an otherwise slightly monochrome CD, and the tracks with harp were some of my favourites on the disc. I did agree with one of the other reviewer's points, however: that the disc is let down by one particular track, Mary's Boychild. This is listed as being English, and a credit for its original composer is not given. The briefest research on the Web, however, reveals not only that it is American, and a spiritual rather than a song or carol (all of which I knew), but that both words and music were written by Jester Hairston. It's certainly not English, anyway, and it is certainly misplaced in a collection of European music. More important, though, is the fact that the words have been altered such that the song no longer makes sense. The line of the chorus which should be: "...that man will live forever more because of Christmas day" has been changed in the Singphoniker version to: "...that man will live forever more because it's Christmas day." Whilst a single word-change may not sound too drastic, in this instance it totally alters the meaning of the song. The message is supposed to be that Christmas day (that is, the birth of Jesus Christ) is the reason why mankind will survive. Die Singphoniker, however, appears to be telling us that we're safe in our beds only because today is 25th December - regardless of the date on which we're actually listening to the CD! Non-Christians may not see the need for the hair-splitting, but to those who do believe in Christmas, the distinction is far from trivial. That little word, 'of', is key to the meaning of the sentence, and indeed of the entire song. As a final amusement, a couple of the singers whistle rather than sing during one of the tracks, Quanno nascete nino, and I was amazed by the extremely high pitch of one of the whistlers' tootlings! As it happens, I'm a pretty good whistler myself, and I have an unusually wide whistling range of two-and-a-half octaves, so I was surprised to hear the whistling in this track, as it's a good half-octave higher than anything I can manage myself! Unfortunately, the highest note in the phrase is conspicuously flat, which does take the shine off the performance for those of us with a sensitive ear. Nevertheless, whoever's doing the whistling has a nice tone. Given that this track is also accompanied by harp, the whistling really adds something, especially when two people whistle together; it sounds rather like a pair of recorders accompanied by harp, and I was sorry that it didn't last longer than its few seconds' duration. Overall, then, this is an interesting CD, well performed, nicely recorded and with an intriguing programme. The CD insert is quite interesting, and includes lots of photos and the words of all the songs on the CD, but the booklet notes have suffered slightly in the translation from German to English, and unfortunately don't come across as coherently as one might wish. Listeners who like their Christmas carols to be performed straightforwardly and simply are less likely to be as enamoured of the disc as fans of the King's Singers' more chromatic style of arrangements, as I do feel that a fairly substantial proportion of the arrangements at least verge on the gimmicky. As should be clear from what I said earlier, I wasn't terribly impressed by Ludwig Thomas's arrangements, and some of the other arrangements on the CD that aren't by him (such as Mary's Boy Child) aren't particularly good either. But it's all a matter of personal taste, after all, and on balance I enjoyed the CD very much, notwithstanding the occasional moment that sounded slightly forced to my ears. There were a good many new Christmas items from around Europe that I hadn't heard before, and which I enjoyed greatly. The singers are all very good; I was particularly impressed by the alto/tenor singer (Hubert Nettinger, I assume), who was able to move freely between chest-voice and falsetto, mid-phrase, without a hint of a gear-change, and with an equally pleasant tone on either side of the vocal divide. Overall, then, this is a good CD which I would recommend quite strongly; not entirely without reservation, perhaps, but any quibbles I might have are matters of personal taste rather than actual problems with the performance or recording. I hope that this review has not given too strong a negative impression, as this is actually a very good CD, and Die Singphoniker is clearly an ensemble to be reckoned with. Certainly, the quality of this CD is sufficient to have inspired me to investigate the same forces' Schubert part-song edition.